When INSIDER recently conducted a blind taste test of iced coffee, the winner wasn’t Starbucks or Dunkin’ Donuts. It was 7-Eleven. That’s because today’s convenience retailers have evolved their coffee offer far beyond a basic cup of regular or decaf. This evolution was on full display at the 2018 Hot Dispensed Beverages Forum in Chicago. The annual gathering brings together key decision-makers and innovators from convenience stores and beverage companies to discuss new trends, products, and strategies. Some convenience retailers now utilize self-serve, bean-to-cup machines from companies like Schaerer—which produce a level of quality on par with many coffee shops. Add to the mix an automated, espresso-based machine from Franke—as retailers like Kwik Trip and Ricker’s have done—and customers can whip up an artisan latte or cappuccino without waiting on a barista. But coffee shops have never been just about coffee. They’re also a place to meet friends, get a meal or snack, and work remotely. 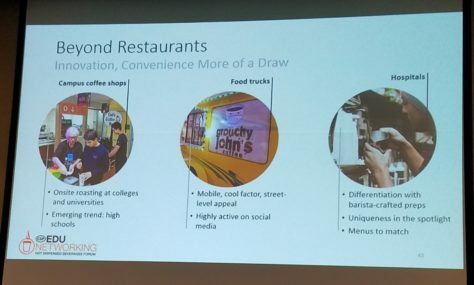 And as I explained during my presentation at the forum’s opening session—titled, “Are Convenience Stores the New Coffee Shops?”—issues with perception and ambiance are limiting the potential of many coffee programs. This was apparent during a recent GasBuddy survey of more than 2,200 engaged app users. 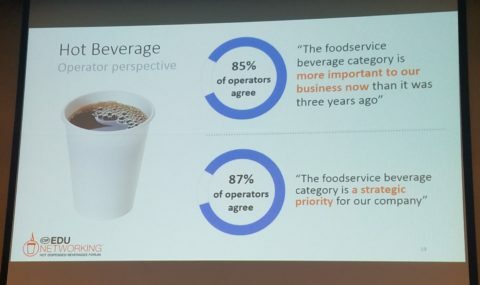 Although respondents gave convenience retailers a slight edge over quick-service restaurants in terms of coffee quality, they felt much differently about foodservice. 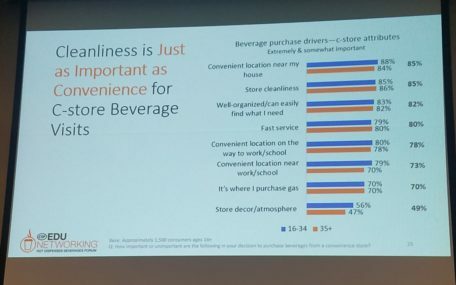 When asked how the quality of coffee compares at convenience retailers and QSRs, 16% said convenience stores provide better coffee, 11% favored QSRs, 35% said they’re about the same, and 38% didn’t know. But when asked the same question about food, only 4% said convenience retailers have higher-quality offerings. 63% favored QSRs, and 33% said they’re about the same. Although many consumers assume that the presence of fuel pumps indicates lower-quality food, it’s easy to understand why they feel that way. Dirty restrooms, messy stores, and poorly-lit forecourts with oil spots and trash—that reflects poorly on any retailer. It also affects foot traffic. In GasBuddy’s Q3 2017 Foot Traffic Report, for example, we discovered that stations with above-average restroom ratings on the app saw a 33% increase in visits over those with below-average ratings. As retailers seek to become coffee destinations, it’s important to avoid the sort of actions that cause poor perceptions and stigmas. Many of today’s consumers may wait for coffee until they arrive at their office or school. Some places of employment now offer single-serve and bean-to-cup machines, and high schools and universities are increasingly establishing their own cafes. Even food trucks are getting in on the game. Foodtruckr.com recently profiled a few leading examples from across the United States, and some entrants have even funded their ventures on Kickstarter. That’s why it’s imperative for convenience retailers to stay on the forefront of current trends. Producers of ready-to-drink coffee-based beverages—and consumer-packaged goods—should also ensure that their marketing efforts connect with consumers in a meaningful way. Every person who waits to grab coffee at work is one less potential customer for snack bars or cold lattes from the cooler. Meeting the demand for quality and variety can be more challenging than some might expect. The final day of the forum explored this issue from the perspective of two retailers: Rutter’s and Yesway. One might expect that variety is a simple task at Rutter’s—given the company’s reputation for its expansive foodservice offer. But even the least-popular coffee flavors have their daily drinkers, and customers can become vocal when an old favorite is replaced on the menu with something new. These seemingly minor actions still require careful consideration from a smart, discerning retailer. Additionally, customers often expect successful seasonal flavors to return the following year, and limited-time offers can be tempting to extend if they become popular—which may not be in the company’s best interest at the time. Yesway’s challenge was somewhat different since a smaller, more streamlined coffee offer was the best fit at their stores. But what flavors would actually resonate with customers? Rather than make assumptions, they turned to their best resource: the customers. Through extensive testing and sampling, they were able to craft a program based on direct feedback and introduce it with confidence. Both cases ultimately emphasize the importance of knowing and understanding your customers. Large stores or small stores, urban or rural—it’s essential in all situations. Today’s retailers also have the ability to leverage location intelligence to gain better understanding of their customers. As Cuebiq’s Antonio Tomarchio explained in a recent article for Adweek, the combination of marketing and sales data with location intelligence enables retailers to gain a full picture of the customer journey and “get a granular view of why a customer visited a store, how they engaged with the brand and what will bring them back.” This is especially important as retailers seek to differentiate both their brand and their product offerings.